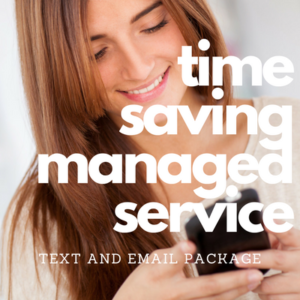 Text and Email Marketing Package just launched and available on introductory pricing this month only. Sending text messages is a simple and effective way to create bookings by reminding past clients to book early or take advantage of an offer. We run a lot of campaigns and found the best platform is Text Marketer. Messages work out at 1.65p (Your first order of 1-20,000). After your first order, they are just 3.3p each. Use Promo Code YZ43987 for your free credits. No time and like us to manage it? A monthly newsletter and a monthly text message are ideal marketing tools. You tell us your news/offers each month, and we take care of the content, art and sending. You also have access to the email and text applications to send your any ad-hoc messages throughout the month. Any questions contact us or call 0116 2160293. We can have a campaign running within a day. * Offer valid until 31/12/17 and limited to first 10 Customers.